There are three different type search query types that a company needs to be aware of when it comes to local search. 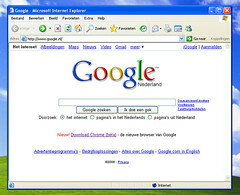 Those being, a search with a large city, that represents the entire metro area in the search term, a search with a logical suburb in the search, and a search with no local intent (city, zip,). Let’s say I’m looking for a house painter for my Mom who lives about 25 miles south of my location. Her home is located in a small sub division by the name of Bowmar. I live in a small city called Lafayette, and both are part of the Denver metro area. What are the most likely methods I will use to search? First I am going to use the (what I call Facet city) Denver. Denver in my mind is generic, and should bring up the best of the entire metro area? 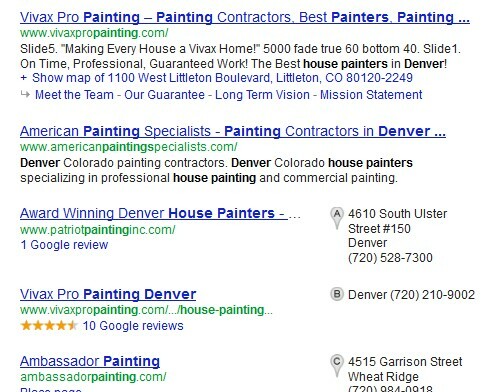 As you can see I get the PPC ads, and then the top few companies that are large established Denver painting companies. Now, because we did the optimization for both, I know more about them then a stranger would. But either will service my Mom’s home, and both are good painters. 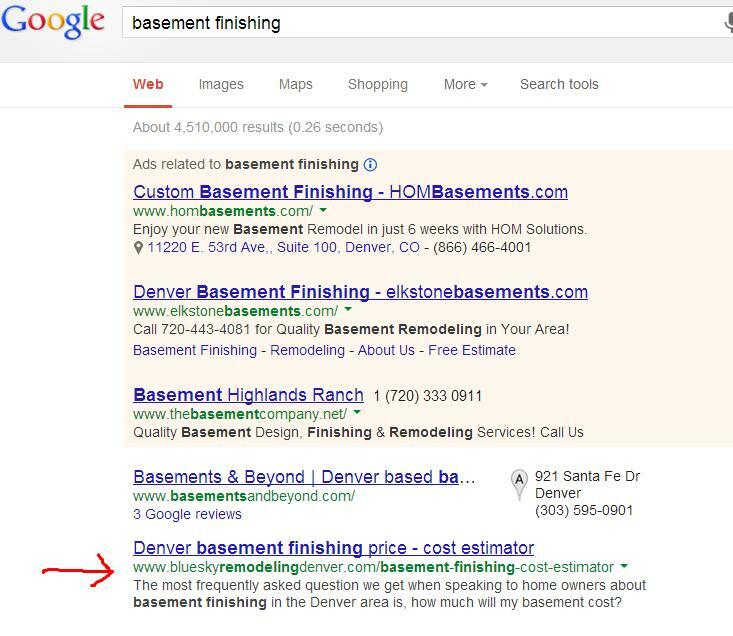 Note that the top two results are NOT Google places or maps listings. They are organic. Also note that Vivax shows up both as the top organic listing and as number 2 in maps. As we did the optimization for Vivax and M and E it’s no surprise these guys show up. But, we didn’t intentionally try and get results in Lafayette. (remember that’s where I am searching from). These results are more of a hangover from these two exceptionally well promoted sites having great rankings and using the city term Thornton as part of their service areas. So, the short story for a company trying to promote their site is this. You need to check all three type search types in mind, and optimize for each. 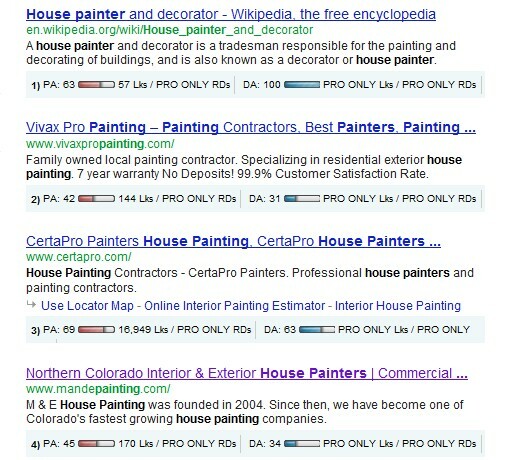 To accomplish this you must optimize both the Places listing and for the organic listings. In today’s local search, in my opinion, organic optimization or site promotion comes first. 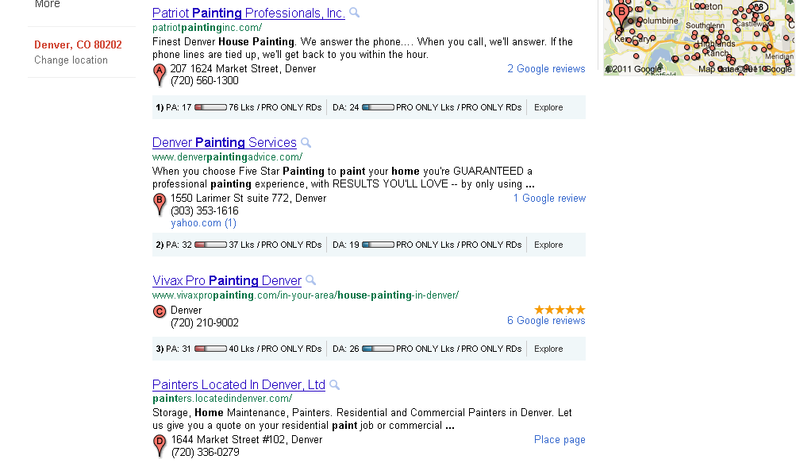 Look at the Denver search again, organic wins over maps. But the most complicated issue is what location Google thinks you are searching from. When I try to find local services I am getting results for companies’ two suburbs away. So as a SEO firm, it’s important to complete local optimization based on a wide geographical area. As many of you know, we use the search engine optimization principle that you should optimize your site by taking actions you would take without any concern for how it will change your sites search engine rankings. In that spirit, here are a few opportunities for local businesses to get more visibility that will help grow their traffic, and present possible sales opportunities even if it doesn’t. For B2C, Angie’s list is an excellent promotional tool. I am not sold on advertising on it, but I know that if you have great reviews on it, people will call you. It’s also an excellent citation on Google Places. 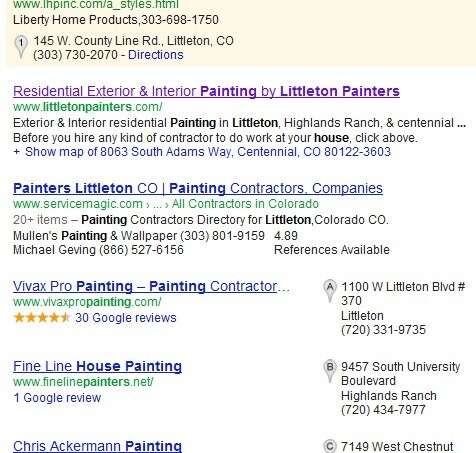 And don’t forget to write reviews on Google places for the businesses you like in your area. They just might return the favor.